Here are just a few of the comments that have come my way. Wow! Got my copy. Superior uke playing. So smooth, so clean. You’ve got a wonderful CD here! — Chris S.
Curt, your CD was fantastic. You are amongst the ukulele masters of our day. — John K.
Received your CD just prior to leaving on a trip last week. Listened to it for 600 miles. Please keep me in mind should you EVER do another one of jazz standards. The only thing I'm sorry about is that I don't live close enough to come see you play live or to get lessons from you. Also thanks for the picks. I've never used that style of pick before, but find that the notes come easier and sound better when using them. They took a bit of getting used to, but now they're all I use. Taking advantage of my jazz guitar skills and over 30 years of private study with internationally recognized virtuoso and master teacher Chuck Anderson, I began pursuing the potential of the ukulele. Researching the field I saw very little material organized at an intermediate or advanced level that really worked for players wanting to explore the ukulele beyond the basics. I have developed an international reputation as a ukulele educator having written many books on the subject of ukulele. I run and maintain the very popular www.LearningUkulele.com web site with over 600 lessons. Check out the Workshops page for available ukulele workshops that Curt has presented across the country at various ukulele festivals over the past 10 years. Curt Sheller is a jazz guitarist with a love for the uke. He has turned his copious and capable knowledge of music theory, and chord theory in particular, and put out some very accessible and worthwhile books. His 'A Guide to Blues Chord Progressions for Ukulele from A to Z' will give you the changes essential to blues and jazz. 'A Guide to Ukulele Chords' is authoritative, concise, direct, and informative. 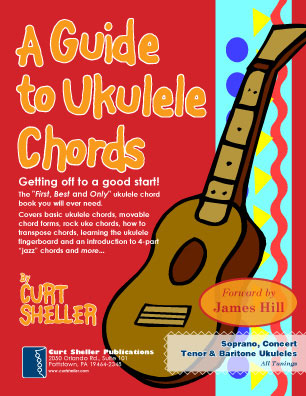 It is a great primary source for knowledge of chords for someone approaching music theory armed with a uke. James Hill wrote the intro. 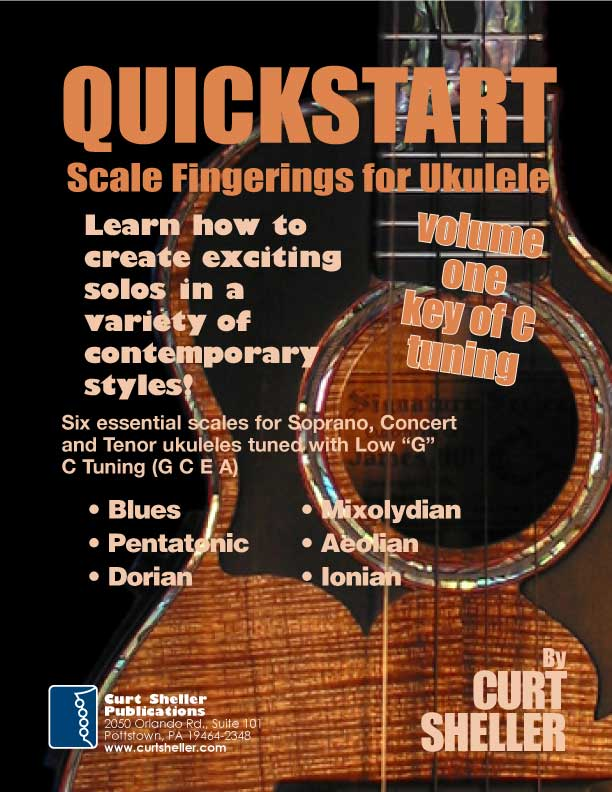 I’m finding all sorts of spiffy stuff in 'QUICKSTART Scale Fingerings for Ukulele'.. Note - This book has been used for courses at Kap'olani Community College and Honolulu Community College in Hawaii for the past several years. My site, in one form or another has been on the web since 1995 and just keeps growing and growing. So there are lot of pages on this site to visit, with a lot of great information. Curt Sheller and Curt Sheller Publications. A small (me, myself and I) independent, by choice, publishing company catering to the needs of musicians, guitar players and ukulele players worldwide. Offering the resources and information needed to develop as a musician. 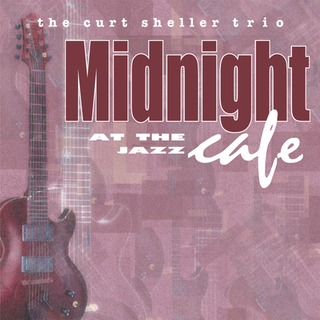 Curt Sheller Publications, created in 1995, has been on the web for over 15 years. I have over 40 years of playing experience and have been involved in private music education for the past 20 years. Taking advantage of my jazz guitar skills, I began pursuing the potential of the ukulele. Researching the field, I saw very little material organized for the intermediate and advanced player. I have developed an international reputation as a ukulele expert having written over 30 books for ukulele and over 500 lessons. Site developed and maintained by Curt Sheller and hosted on DigitalOcean and managed using Laravel Forge .